While fans wait for the highly-anticipated Star Wars: The Last Jedi, which is just over two months away, fans have been getting a slew of new details on Star Wars: A New Hope and other Star Wars movies thanks to a new book released this week entitled Star Wars: From a Certain Point of View. This book tells 40 stories from 40 different authors, to celebrate the 40th Anniversary of the iconic franchise, by telling untold stories that answer some questions fans didn't even know they wanted the answer to. For instance, we reported yesterday that the Boba Fett "no disintegrations" mystery was solved by one story in the anthology, and now another mystery from A New Hope has been put to rest, involving the infamous Stormtrooper that was never seen, TK-421, the Stormtrooper who infamously wasn't at his post in A New Hope. TK-421, portrayed by actor Stephen Bayeley in an uncredited role, was a Stormtrooper stationed on the Death Star in Star Wars: A New Hope, who was tasked with guarding the Millennium Falcon, while a scanning crew boarded the ship to search for any inhabitants. Ultimately, TK-421 and another Stormtrooper responded to a call for help aboard the Falcon, which lead to them both being ambushed by Han Solo (Harrison Ford) and Chewbacca (Peter Mayhew). This lead to the iconic line by the late Peter Sumner's Lt. Pol Treidum, "TK-421, why aren't you at your post? TK-421, do you copy?" 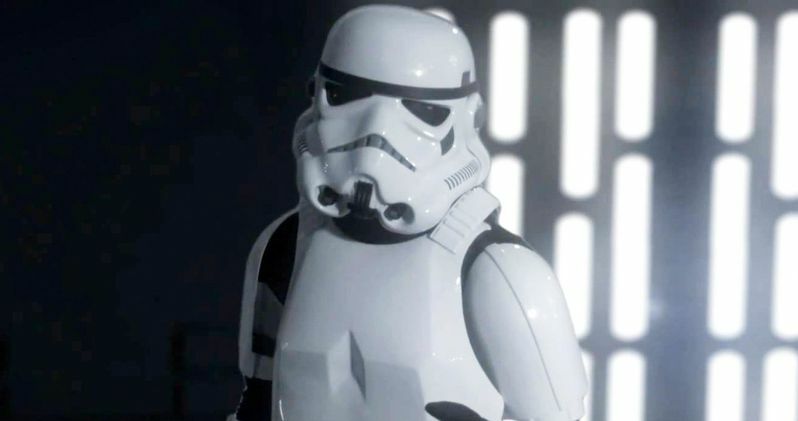 Both Luke Skywalker (Mark Hamill) and Han Solo (Harrison Ford) used TK-421 and the other Stormtrooper's costumes to infiltrate the Death Star and ultimately save Princess Leia (Carrie Fisher). This new story in Star Wars: From a Certain Point of View reveals that he got this post in the first place due to a secret gay romance he was involved in. This previously-untold tale is laid out in the story "Of MSE-6 and Men" by Glen Weldon, which is told from the point of view of G7, a MSE-6 series repair droid, also known as mouse droids. This droid was actually seen briefly in A New Hope, who scurried off in the other direction when Chewbacca roared at it. This droid was actually owned by TK-421, with the droid capturing a brief hologram recording of TK-421 and accidentally playing it when running into an Imperial officer. The officer was so smitten by the recording, calling TK-421 "beautiful," he sent a secret message back to the Stormtrooper through the G-7 droid, which TK-421 used to his advantage. The story sets up that TK-421 wasn't terribly happy being stationed on the Death Star, and wanted a new post on Coruscant. He ultimately used this Imperial officer's interest to help get a more desirable gig, sending the droid back with another message to give "him something to get started with." A secret homosexual affair then ensued, with the Stormtrooper and the Imperial officer continually erasing the droid's memories after their secret trysts, telling the droid there are some things it doesn't need to see, "human being stuff" that is complicated and messy. Ultimately, the affair paid off for TK-421, with the officer using his pull to assign TK-421 to "station security," a much better post than he had, with his task of guarding the Millennium Falcon his first assignment in his new role, that ultimately lead to him being ambushed aboard the Falcon. The anthology book also includes tales that shed new light on other characters like Grand Moff Tarkin and Admiral Motti, which are all told from unique perspectives, like the G7 droid, or the Boba Fett story being told entirely through the internal monologue he has in his mind, during a scene that was added into the Special Edition of A New Hope where Han Solo has a brief chat with Jabba the Hut. While this story, with brief excerpts courtesy of Nerdist, won't shed any light on Star Wars: The Last Jedi or any of the other future movies, they will certainly help fans pass the time until these movies hit theaters.